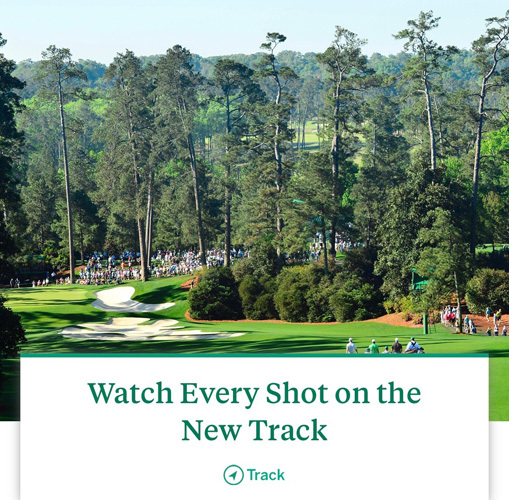 The stupendous Masters app feature New Track is a must-experience. It’s a far cry from the miserly two hours a day viewing Augusta officials limited us Masters-addicted golf fans back in the day. It’s another miracle of evolving and expanding modern technology boundaries. GeoffShackelford.com does a nice job explaining the pros and cons (mostly pros) of the new tech that will undoubtedly greatly increase your mobile phone usage the next few days. —We are already seeing new camera angles and shots we have not seen before. —The shots include graphics with score information as well. —The design is simple and makes sense on a desktop or on the Masters app. —Speed is varying, from within minutes of a player completing the hole to a half-hour in some cases. If you haven’t done so already, give it a go…trust me. And prepare yourself to being glued to your device.